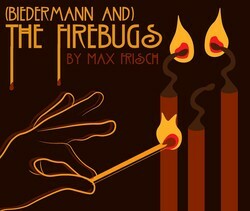 "(Biedermann and) The Firebugs" will be presented at 7:30 p.m. Tuesday through Saturday, Feb. 27 through March 3, in W.M. Turner Auditorium in the Griffith Fine Arts Building, 2222 Alumni Drive, on the SFA campus. NACOGDOCHES, Texas - There's a line in the show: " … the best camouflage of all, in my opinion, is the plain and simple truth. Because nobody ever believes it." Dr. Richard Jones had long forgotten that line in Max Frisch's play "(Biedermann and) The Firebugs," but he remembered this theme from when he first read the play more than 30 years ago. "I was thinking about some specific episodes in my own life, but especially about the political climate today," he said. "Ultimately, I was intrigued by the fact that the major surprise in this play is that there are no surprises in this play." Jones, professor of theatre at Stephen F. Austin State University, will direct "(Biedermann and) The Firebugs" when the School of Theatre presents it as part of this year's Mainstage Series. "Really, everyone knows what's going to happen within the first 10 minutes," he explains. "The play is not so much about where we're going as how we get there." The play was originally written as a response to Nazism/Fascism, Jones explained. "It comes from a moment in time when absurdism took on a political element and, in this case, overlapped with the more overtly political form of epic theatre," he said. "Playwright Max Frisch was not infrequently accused of Communist sympathies. Certainly his politics leaned a little to the left, but he was really more anti-Nazi than pro-Marxist." The play presents its share of challenging moments for a director, Jones said, one of which is that it moves in and out of presentational vs. representational style. "That is, there are moments when the characters explicitly acknowledge the audience, and moments when the actors pretend not to notice the audience at all," he said. "It's also a very funny play, but if it lapses too far into farce, the themes of ethical behavior, moral courage and critical thinking are subordinated." Jones said another challenge is the number of new theatre students the play will feature in its cast. "It's always a challenge to work with new people," he said. "I've previously directed only two of the 13 actors in this play, and over half the cast wasn't at SFA a year ago. The newcomers are all great to work with, but it inevitably takes a little more time for them to know what to expect from me, and for me to figure out how to help them do their best work." Student actors will learn from the mix of styles in the play, and from the many lines (more than usual, according to Jones) that can be interpreted in fundamentally different ways. "That's especially challenging, because the temptation is to split the difference, and we end up losing the sense of the moment altogether," Jones said. Jones hopes the audience will appreciate and enjoy the humor in the play. "I hope they have a good time and share a few laughs with us," he said. "If they leave a little more likely to confront their fears and do the right thing, even at a risk, so much the better." The play is appropriate for all ages. However, young children probably would not understand it, but those in mid-teens and up would comprehend its themes. Single tickets are $15 for adult, $10 for senior and $7.50 for student/youth. For tickets or more information, call the SFA Fine Arts Box Office at (936) 468-6407 or visit http://www.theatre.sfasu.edu/.